Celebrate the summer/fall in your new home! This home has the space to expand as your needs grow. Youll love the open main floor which connects the kitchen and great room for a variety of entertaining. The kitchen adds a modern flair with an over-sized enlarged "eat in island, Maple Java stained cabinetry and brand new Whirlpool appliances. This beautiful home features Peppercorn 5" plank wood floors throughout the main floor and plush carpeting through the hallway and bedrooms on the third floor. 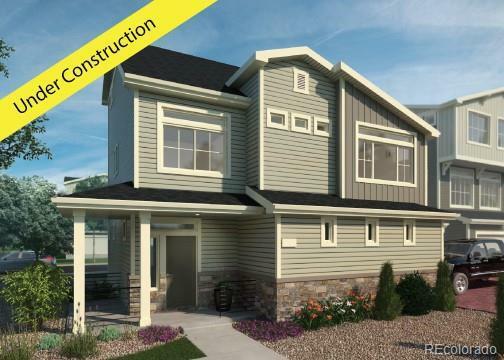 Walk upstairs to find the master suite with walk-in closet and spa walk-in shower as well as two secondary bedrooms and conveniently located laundry room! Need more space? Walk down stairs to the first floor Flex Space offering space for an office, playroom, work-out area, you choose! Let's not forget about the outdoor living with a balcony off the front and a deck off the back! Call today and come see why we are the builder of choice for Colorado families!